The reverse of the bunting is silver with a sparkle finish. 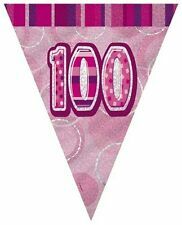 Each flag has a prismatic foil design in shades of pinks giving a glittered effect surrounding a central number 100. The reverse of the bunting is silver with a sparkle finish. 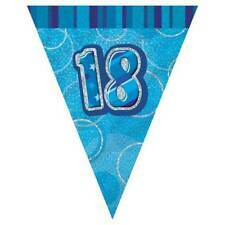 Each flag has a prismatic foil design in shades of blues giving a glittered effect surrounding a central number 18. The reverse of the bunting is silver with a sparkle finish. 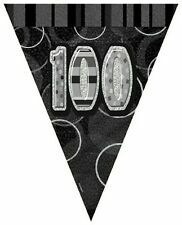 Each flag has a prismatic foil design in black & silver with a glittered effect surrounding a central number 100. A 12ft long black cord is decorated with alternating black foil mortar boards & hanging foil gold & silver dangling swirls. Approx 12ft / 3.6m long. A great decoration for the Graduation celebrations. More than just a banner - A decoration all in itself ! Give your party that finishing touch! 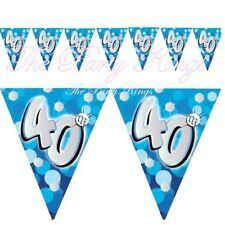 The deluxe embossed foil garland consists of age 30's alternating with foil balloons embossed with stars. The balloons have silver foil swirls dangling beneath them. Give your party that finishing touch! This holographic wall banner is 2.5m long and wall banners are an essential addition to your party decorations adding to the excitement of the occasion! This product is supplied by Simon Elvin Ltd with barcode: . The reverse of the bunting is silver with a sparkle finish. Each flag has a prismatic foil design in shades of pinks giving a glittered effect surrounding a central number 13. The reverse of the bunting is silver with a sparkle finish. Each flag has a prismatic foil design in black & silver with a glittered effect surrounding a central number 13. The reverse of the bunting is silver with a sparkle finish. Each flag has a prismatic foil design in black & silver with a glittered effect surrounding a central number 16. The reverse of the bunting is silver with a sparkle finish. Each flag has a prismatic foil design in shades of pinks giving a glittered effect surrounding a central number 3 0.